I'm an experienced problem solver and communicator with over 10 years of experience working in engineering, software, and R&D. [finance] Analysis and Critique of iShares XTR, Diversified Monthly Income Fund. For ETF investors: analysis of the fund's artificially high distribution yield. [security] Network Security presentation covering Wi-Fi security (802.11) and insecure communication channels. Invited lecture at University of Manitoba, Department of Electrical and Computer Engineering, February 2009. [security] Berkes, J. Side-Channel Monitoring of Contactless Java Cards. MASc thesis, University of Waterloo, 2008. [communications] Berkes, J., Schaub, D., Czyrnyj, T., and Olivier, J. Design of a Voice over IP System that Circumvents NAT. Technical report prepared for undergraduate design project, University of Manitoba, 2004. Side-Channel Monitoring of Contactless Java Cards (completed 2008), thesis for Master of Applied Science in Electrical and Computer Engineering at the University of Waterloo. The thesis is based on lab work which examined side-channel attack techniques for contactless smart cards (RFID cards). Some of the card monitoring and measurement techniques developed are the first ever documented procedures of their kind, using only unmodified COTS hardware without requiring any custom or proprietary hardware/protocols. renattach-1.2.2 (released 2004) is an efficient and highly effective Unix mail filter. It catches potentially dangerous attachments based on file extension, helping protect general users from malicious content in emails. Because it's not actually a virus scanner, there are no virus 'definitions' to maintain and there is very little processing overhead. The dangerous attachments can be renamed, deleted from the message, or the whole message can be killed/absorbed. The filter can run on Unix-like (including Linux, BSD) mail servers and is currently being used by several universities. 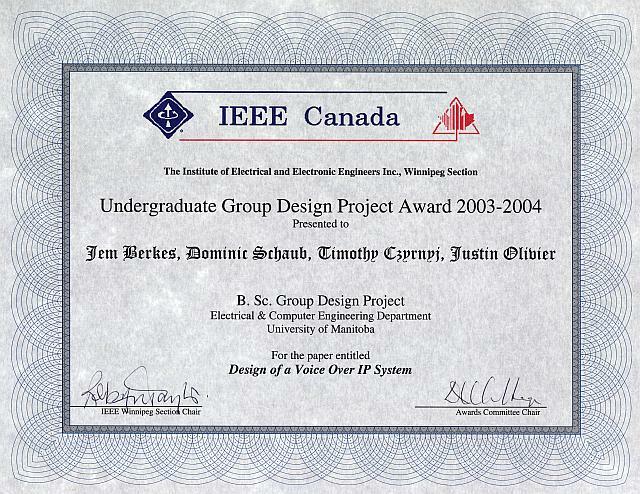 Design of a Voice over IP System that Circumvents NAT (completed 2004), by Berkes, Czyrnyj, Olivier, Schaub at the Department of Electrical and Computer Engineering of the University of Manitoba. 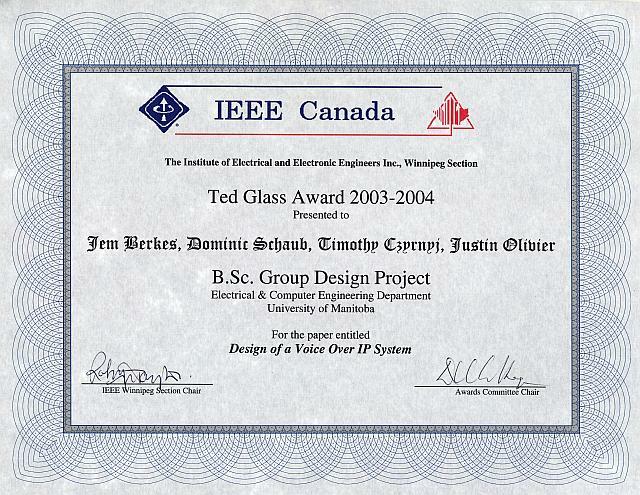 We were thrilled to receive IEEE's Ted Glass Award as well as IEEE's Group Design Project Award for 2003-2004. JBMail 3.2 (released 2003) is a small but powerful win32 email client designed for portability and security. It's one of the very few Windows mail clients with full SSL/TLS functionality for both POP3 and SMTP. Other features include server-side mail storage, stripping of HTML down to plaintext, and advanced header-based junk filtering. JBMail is used worldwide and has the support of several Internet Service Providers. Digital Copyright Canada group for citizens' interests. Involved in the Petition for Users' Rights with respect to copyright law in Canada. Read my Q&A on proposed changes to Canadian copyright law.